Pte A W Bottrill, 2nd Co. 1st Coldstream Guards, has written to his parents, residing at 94 Bridget Street, Rugby, stating that he is in hospital suffering from rheumatism and a shrapnel bullet wound in the shoulder. He was being transferred to Versailles, near Paris. 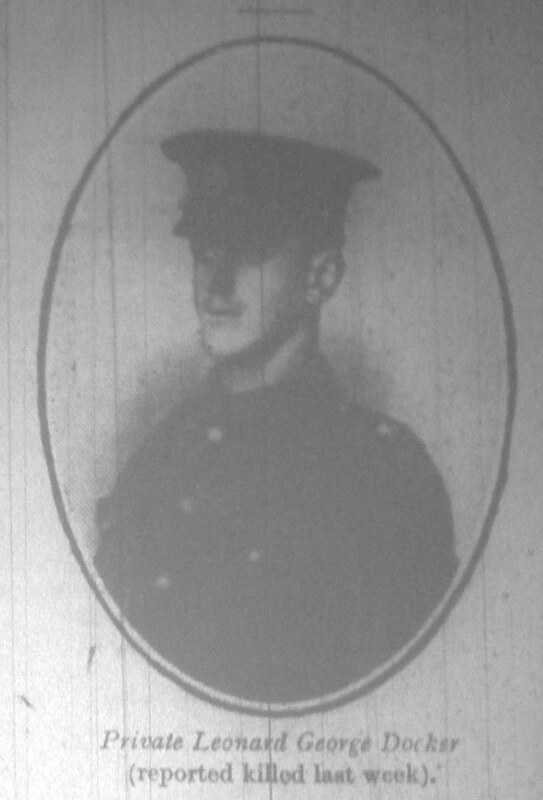 Pte Bottrill, who is a reservist, was employed in the Turbine Department of the B.T.H, and was called up on August 5th—two days after his marriage. In one of the postcards he has sent home he states that he has heard from some of the Royal Warwicks that his brother Frank, who is a reservist in that regiment, was wounded, but so far the parents have received no confirmation of this. Pte Frank Henry Bottrill, of the Royal Warwickshire Regiment, was admitted to Boulogne Hospital on Easter Sunday, suffering from a severe bullet wound in the head, and as the result of an operation he has lost the sight of the left eye. Pte Bottrill who was a reservist, and is married and lives at Wellingborough, is an old St Matthew’s boy. His brother-Pte A W Bottrill, of the Coldstream Guards—was badly wounded on November 2nd, and has never really recovered from the effects of the wound. He has, however, been back to the fighting line ; but the last news that was heard of him was that he was at Havre recuperating, although he expected to be soon drafted back to the trenches. On the 23 September 1916 it was announced that Lance Corp. A. W. Botterill was wounded. From the war diary we learn that on the 2nd March 1918, the 2nd battalion Coldstream Guards had been relieved by the 2nd battalion Grenadier Guards and had returned to Arras to billets in Arras prison. They had undertaken training for three days, before marching on the 6th March to the support line relieving the 1st battalion the Irish Guards. On this journey 1 other rank killed and 4 other rank wounded. They remained in support trenches till the 10th March, when the battalion paraded at 7:20pm and relieved the 1st battalion Irish Guards at the front trenches till the 14th March. They were relieved by the 2nd battalion Grenadier Guards and proceeded to Sterling camp arriving about 10:30 pm. From the 15th to the 17th March they were training in Stirling camp and on the 18th March the battalion paraded at 7 pm and marched to relieve the 1st battalion Irish Guards in the support trenches, casualties 1 other rank killed (this would have been A W Botterill) 5 other ranks wounded. Hugh was the youngest of the four sons of Thomas Lissimore and Hannah Mary nee Roberts who were married in Wellingborough Registration District, Northamptonshire, in April Quarter 1891. His brothers were Ernest John b 1893, Cecil Joseph b 1895, both at Wellingborough, and Arthur Thomas b 1897 at Stanwick Northants; Hugh was born in 1899 at Higham Ferrers, Northants. In 1901 the family was living in Irthlingborough, Northants, Thomas was a cement works manager born in Tividale near Dudley Staffordshire, his wife Hannah came from Chesterfield. Perhaps his occupation was the reason for coming to Rugby to work at the cement works here, but in 1906 Thomas died at Dudley aged only 38. Was he on a family visit or did Hannah have ties with the town? Certainly Hannah was at 45 Jubilee Street in New Bilton in 1907 when all four of her sons were baptised at Bilton Church on 17 February, their father is noted in the register as “deceased”. It has not been established whether she came to Rugby before or after her husband’s death. Hannah was still at Jubilee Street in 1911, with just the two youngest boys Arthur and Hugh – she says she is “on an allowance”. According to Soldiers Died in the Great War Hugh enlisted at Warwick and joined the 2nd Battalion Coldstream Guards as Private 19339. He was killed in action on 28 November 1917, his death was reported in the Birmingham Daily Post on 21 December when his mother was living at 23 Lodge Road. Hugh is described as a former scholar of St Matthew’s School in Rugby who had only been at the front for a few months. Hugh is commemorated on the Cambrai Memorial at Louvreval, France. His mother and sole legatee received his back pay of £5.14s.8d and a War Gratuity of £4. According to the Commonwealth War Graves Commission citation, she was living in Coventry Road, Dunchurch when the memorial was set up. She died in 1962, her Executor was her son Cecil, a retired Lieutenant Commander in the Royal Navy. Hugh was awarded the Victory and British War Medals. 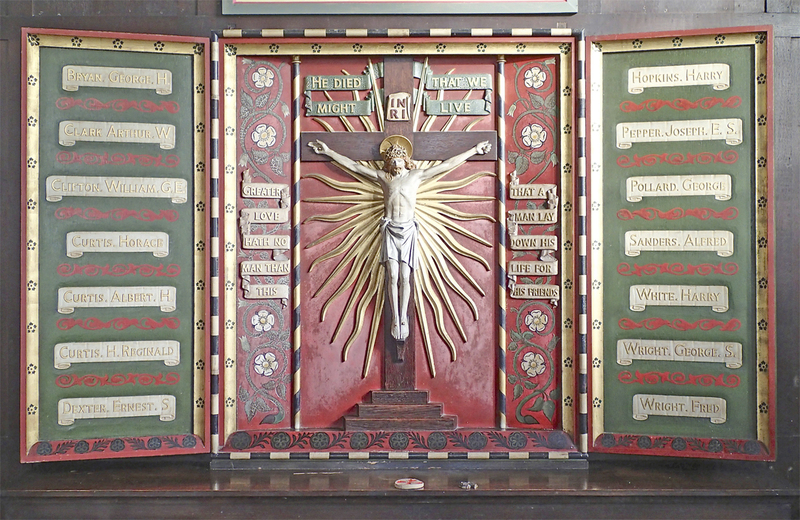 As well as being commemorated on the Memorial Gates, his name appears on the memorial at St Philip’s Church, Wood Street, although as this church is now closed, it is not known if the memorial is still there. The names were recorded by The Rugby Advertiser on 12 November 1920 when it was unveiled. Charles Robert Lee was born in 1879 in Rugby and was baptised 20th Feb 1880 at St Andrews Church Rugby. He was the son of Mary Ann Lee (nee) Batchelor who was born in Rugby in 1859 and Henry Lee who was born 1857 in Derby and died circa 1880. In 1881 he lived at 34 Railway Terrace Rugby, the home of his grandparents John Batchelor and Sarah Jane Batchelor (nee Brooks). Also at this address were his mother Mary Ann Lee and his brother Thomas Henry (who was born in 1877 in Derby), together with six of Mary Ann’s siblings. In 1891 he lived at 18 Gas Street together with his mother Mary Ann who had now remarried James Barnett, a bricklayers labourer. His brother Thomas was living there too, together with two sons of James Barnett aged 3 and 3 months and Mary Ann. Charles enlisted in the Coldstream Guards and served as Private No 876 in the 5th Battalion in the South Africa War. He served at the Belmont and Modder River and was wounded in eight places in his arm in the 2nd Boer War at Magersfontein on 11th Feb 1899. Following this he was partially disabled and received a pension. In 1901 His mother Mary Ann was widowed again and a laundress. They lived at 11 Gas Street Rugby together with his brother Thomas (a brickmaker’s labourer and three step brothers, James Barnett born 1889, Frances Barnett born 1894 and Samuel Barnett born 1895. They had a lodger too, Walter Sansom born 1880 in Thornton Heath Surrey, a groom. Charles’ mother Mary Ann married Walter Sansom later that year. On 13th August 1904 Charles married Elsie Rose Maltby, born in Daventry in 1882 and died in Rugby in 1944. The marriage was at St Andrews Church Rugby. They went on to have five children: Henry Thomas Lee born 1905, Winifred Lee born 1907, Rose Ann Lee born 1908, Daisy Lee born 1911 and Francis James Lee born 1912, all in Rugby. He was a well known Rugby footballer and played for the Star New Bilton, Britannia, Rugby First, Northampton, Coventry and represented the Midland Counties. He offered to rejoin his old regiment again in the First World War and served with the Coldstream Guards for eighteen months. He was admitted to the Hospital of St Cross in Rugby and died there following an operation on 6th September 1916. He is buried in Grave K279 at Clifton Road Cemetery Rugby together with his stepfather James Barnett. His stepbrother Samuel Barnett who died in the First World War on 25th September 1915. Charles was awarded the Victory & British War Medals. WILD THYME NEEDED FOR WAR PURPOSES. AN OPPORTUNITY FOR SCHOOL CHILDREN. Many people are anxious to help their country in the present crisis, and children will be interested to learn that there is a way in which they can assist. Wild thyme, which grows plentifully in certain localities—and also the cultivated variety for the matter of that—forms the basis of an important disinfectant, of which there is just now a great shortage. At Rugby School Chemical Laboratory arrangements have been made in connection with some work asked for by the War Office, by which large quantities of thyme can be dealt with. Here is a splendid opportunity for school children to render valuable aid, and an appeal is made to boys and girls of the district to collect as much thyme as they possibly can during the next six weeks, and forward the same to Mr B B Dickinson, 5 Barby Road, Rugby. Of course, it is expected that this will be done voluntarily, as there is no fund from which payment can be made ; but no doubt many children will be glad during their holidays to gather the thyme growing wild in the locality near their homes, and if in each village community one or two leading residents will interest themselves in the scheme, and see that the thyme when collected is duly despatched to Mr Dickinson, their assistance will be much appreciated. In most large gardens, too, there is sure to be a certain quantity of the cultivated thyme in the portion allotted to herbs, and this will also prove most acceptable. Anyone willing to contribute or help in any way is invited to communicate with Mr Dickinson, who will be glad to give further information. SHIRTS AND SOCKS WANTED FOR “ E ” COMPANY. Mrs Spencer, 17 High Street, Rugby appeals to the people of Rugby on behalf of the Rugby boys of the old “ E ” Company, serving in France, for shirts and socks, or subscriptions for purchasing same. The boys are badly in need of both shirts and socks, and Mrs Spencer will be pleased to receive same at her residence to forward to them. Some have already been sent out, but many more are needed, as there are between 60 and 70 boys of the old “ E ” Company serving in France. APPRECIATION OF RUGBY LANDLADIES’ MESSAGE. To the Editor of the Rugby Advertiser. I myself received the paper while in the Red Cross Hospital at Giza, Cairo, Egypt, where I am recovering from wounds received in Gallipoli, and after perusing its columns I blue-pencilled the message and re-posted this good old Advertiser to my chum on the Peninsula. A few days afterwards I received a letter telling how the paper was passed from hand to hand along the trenches of my regiment (the Inniskillings), and how the message brought memories back and gave the battalion something to talk about—for landladies were the sole topic in the trenches for the next week, and all were saying how they would enjoy themselves in Rugby when they had completed the job on hand, viz, dealing out to their “ Oriental friends ” a very-much-needed lesson. Red Cross Hospital, Giza, Cairo, Egypt. Pte George Walden, of the 2nd Coldstream Guards, who went out to the front with the original Expeditionary Force, is visiting his patents at 20 Campbell Street, New Bilton, on sick leave, having been wounded in the wrist at La Bassee on June 15th. During the ten months that he was at the front Pte Walden took part in the big engagements in which the British were concerned, vis, the Retreat from Mons, the Battle of the Aisne, the first attempt on Ypres, and the glorious charge in the La Bassee brickfield. In his opinion the worst engagement, however was the rearguard action in the retreat from Mons, when the British covered 186 miles in eight days. Personally, Pte Walden has been very lucky, for although practically the whole of the original battalion to which he belongs has been wiped out, it was ten months before he was hit, although on more than one occasion he has had narrow escapes. On one occasion during the fighting round Ypres he had an exceedingly close shave. Being a staunch teetotaller, he refused tea with rum in it, and went out to fetch some water. The Germans caught sight of him, however, and opened fire with a machine gun. Realising his danger, he fell on to his stomach, and crawled the remainder of the way. On his return he was again fired upon, but luckily reached the lines safely. Our representative then asked Pte Walden what was his opinion of the personnel of the German army, and whether the stories to the effect that it was not so good now as at the beginning of the war were true ? In reply, he stated that there was little doubt but that the flower of the German Army had been destroyed, but the present troops were quite as good as their predecessors in trench warfare. It was in advances and retirements, however, that the difference was apparent, and in these directions the German troops of to-day were vastly inferior to those Germans who faced the British in the early days of the campaign. The original Prussian Guards were a fine body of fighters, but by the Kaiser’s orders they were pitted against the British Brigade of Guards, who completely wiped them out. Pte Walden paid a tribute to the marksmanship of the German troops and to their effective use of the hand-bombs. In conclusion, he wished to remind readers through the medium of this paper that the most acceptable gift at the front is “ Woodbine ” cigarettes, which are in greater request than any other brand. WOUNDED SOLDIERS ENTERTAINED.—A party of nineteen wounded soldiers from the “ Ashlawn ” Hospital, Rugby, were very kindly entertained on Tuesday last week, by Mr and Mrs Wilcox, of “ The Knob,” Stretton-on-Dunsmore. The party, in charge of a nurse, arrived about three o’clock by break, which Mr Wilcox had sent for them, and various amusements, including whist, were indulged in till four o’clock, when tea was provided indoors, as, owing to the uncertain weather, it was not thought advisable to sit outside. After tea the party spent the time strolling round the garden. A start was made for home about six o’clock. The wounded men were very hearty in their thanks, and were loudly cheered by the villagers when they left. On the kind invitation of Mr and Mrs Wilcox, many of the inhabitants assembled to meet the soldiers, and were hospitably entertained afterwards. Among the wounded guests were some men who were present with their regiments when the King inspected the famous 9th Division on the London Road, a few days before their departure to the Dardanelles. The drive down the London Road was, therefore, particularly interesting to those men. GRENADE-THROWER WOUNDED.—Recently Messrs F W Neal and Thomas Neal went to London to see their brother Jack, who lies badly wounded in the King George Hospital. Jack Neal was one of 25 picked men who were instructed to throw hand-grenades into the German trenches, which were only about 13 yards away. Before throwing the soldier pulls a piece out of the ball, which leaves him only a few moments before it goes off. Somehow one that Jack Neal was going to throw went off in his hand, which it very badly damaged. The extent he does not yet know. He has part of a finger off and one hanging loose ; he is also badly wounded down the right leg, and it is said it is miraculous that he escaped alive. Jack Neal enlisted in December. The other week he just escaped with his life. His company were asleep in the trenches with someone on watch when his pal (Tibbs, from Napton) shouted to them to get out quick. He had to call several times before the worn-out soldiers heard him, and just as they bolted to safety a shrapnel shell came down where they had been asleep. It killed the fellow who followed Jack Neal when racing from the spot, and smashed up Neal’s rifle. SAPPER C W WALTON’S LUCKY ESCAPE. Sapper Charles W Walton, of the Royal Engineers, youngest son of Mr E Walton, 81 Claremont Road, recently had a remarkable escape from death at the front. On July 1st, at Festubert, he was working with a small party, including Sapper Snook, of Rugby, who, as we reported last week, was also wounded, when he was struck by a bullet in the region of his heart. Upon examination it was found that the bullet had struck a pay book and wallet, which were in a pocket immediately over Sapper Waltons heart. These evidently diverted the course of the bullet, and saved the young man’s life. The book and wallet, together with the contents of the latter, were considerably damaged, and at first sight bear the appearance of having been gnawed by a mouse. Sapper Walton joined the Army in August, and is now in the Sussex County Hospital, Brighton, where he is doing well. On Friday last week his photograph appeared in a daily paper in connection with a garden party given for wounded soldiers there. THE WARWICKSHIRE YEOMANRY IN EGYPT. A Rugby member of the Warwickshire Yeomanry in writing to a friend, states that they are now encamped in one of the best parts of Alexandria, close to the sea, where there is some fine bathing. The regiment has been turned into an army of occupation, so that there is little prospect at present of them seeing any fighting ; and this, the writer says, has given rise to a certain amount of grumbling, the men not liking their inactivity. He states that he receives the Rugby Advertiser each week, and notices that recruiting is still going on, and ventures the opinion that some of those who are hanging back ought to go to Egypt and see some of the wounded Australians, who had been brought back from the Dardanelles. These had not only bullet wounds, but deliberate atrocities had been committed upon them by the Turks. “ If these men could only see such sights as we who are here do Lord Kitchener would have 3,000,000 men.” At present, he says, the Yeomanry are doing routine work, principally training the horses they received to replace those which were on the Wayfarer. They recently experienced a dust storm. The wind blew half a gale, carrying dust and sand with it, and filling everything with fine sand. The temperature was 108 in the shade and 132 in the sun, and the men of the regiment, who were in “ stalls ” at the time, went into the sea and stood with the water up to their chins for two hours. The storm lasted from 9 a.m to 3.30 p.m ; and the men, he facetiously adds, were “ eating ” sand for two days afterwards. He concludes with the opinion that there is no place to beat Warwickshire, with its green fields, even if it is cold and wet. One can have too much sand and sunshine. BRITISH TROOPS IN A FAVOURABLE POSITION. RUGBY MEN WIN THE D.C.M. News has just been received in Rugby that one of the first volunteers to enlist from the B.T.H Works has been decorated with the Distinguished Conduct Medal. This decoration has been awarded to Pte A Hotz, of the 1st East Surrey Regiment, for conspicuous gallantry on Hill 60, where he placed himself in front of a communication trench occupied by the enemy, and on the enemy advancing attacked them with hand grenades and dispersed them. Pte Hotz was employed in the construction department at the B.T.H Works, and the members of the staff are naturally very pleased that this award for gallantry has been received by one of their number. Lce-Corpl P V Stent, of the 5th Service Batt Oxford and Bucks Light Infantry, whose parents live at 28 Worcester Street, Rugby, has received the D.C.M for valour in the trenches, He was a bomb-thrower, and succeeded in taking a trench almost entirely by himself. He brought back with him an explosive mine and showed it to his Colonel. Lce-Corpl Stent was for seven years in “ E ” Company, Rugby, and when he enlisted at the beginning of the war was employed as a moulder at Willans & Robinsons. The following have been recruited at Rugby Drill Hall during the past week :-H Smith, R.W.R ; J Ryan, Scottish Rifles ; J Clowes, R H Lucas, R S Hirons, H R Hirons, and H Matthews, East Kent Regiment ; E Humphries Webb, Oxon and Bucks L.I ; E J Dalzel, J Welch, and H Lines. R.A.M.C ; C A Goodman, R.F.A ; J Andrews, R.G.A. More recruits are still wanted, and arrangements have been made for each town to raise its own Company, to be drilled together. At present those who are willing to join are asked to send in their names to the Recruiting Officer, Drill Hall, Rugby. When sufficient men have been obtained to start training they will be called up. Leonard was the youngest son of Oliver Atkins Docker and his wife Martha nee Freer, who were married at Rugby St Andrew on 8 Jun 1881 when both were of Dale Street, Oliver being a railway fireman. Leonard was born 7 Jul 1896 and baptised at St Andrew 11 October 1896, his father was still a fireman, living at 144 Oxford Street. He had four older brothers, Ernest Frederick b 1882, William John b 1883, Arthur Oliver b 1887 and Albert Edward b 1889. All the children were baptised at St Andrew. In 1901 Leonard was aged 4, living with his parents and three brothers (William had died as an infant) at 50 Oxford Street. His father by now was an engine driver, born at Exhall on the outskirts of Coventry. In 1911 the family was living at 155 Grosvenor Road, Oliver was employed by the LNWR, still as an engine driver. Only Albert and Leonard, then aged 14 and a winder at an electrical works, were still living at home. His obituary in the Rugby Advertiser of 17 July notes that Leonard attended Murray School, and had sailed for Canada at the end of March 1913 on the SS Dominion, stating he intended to take up farming, and settled at Brissevain in Manitoba. On the outbreak of war, as he was too late to join the Canadian Contingent, he immediately came back to England aboard the SS New York, arriving at Liverpool on 8 October 1914, and enlisted straight away at Birmingham. He arrived in France on 27 Apr 1915, went to the Front in early May and was killed by a shell on his nineteenth birthday in July (de Ruvigny’s Roll of Honour 1914-1919). Four other members of his regiment were killed with him and his parents were informed that all five were buried at the time in the same grave. Indeed, four other men from the same Battalion are buried at Cambrin, although dates of death given by the Commonwealth War Graves Commission are between 6th and 10th July. Leonard was granted the three medals, Victory, British War and 1915 Star. John Tinley Dixon was born at Bishops Wearmouth, Sunderland in 1880. He was the eldest son of Thomas Grieves Dixon and Amelia (nee Pearson?). Thomas worked in a Cattle Spice Works and later as a Mineral Water Syrup Maker (1911). In 1911 John Tinley Dixon was a single man, living with his parents at 15 Howarth Street, Sunderland. His occupation was an Engineers Turner at Engine Works. The following year he was living at 40 Hunter Street, Rugby and he was still an engineer, although it is not known where he worked. On 3rd August that year, he married Lillian Elizabeth Cleaver of Queen Street, daughter of Thomas Daniel Cleaver, a window cleaner. In 1901 John had not been living with his parents. He had joined the army and was at Chelsea Barracks in London. Aged 20, he was a soldier in the 3rd Battalion, Coldstream Guards. No service record has been found, so it is not known if he fought in South Africa. He must have been in the reserves by 1914 as he was called up at the start of the war and arrived in France with the British Expeditionary Force on 21st August 1914. He would have fought in the Battle of Mons and the First Battle of Ypres. He was probably killed in the winter operations of 1914-15, when trench warfare was becoming established. Lance Corporal J T Dixon, 1858, 2nd Bn. Coldstream Guards died on the 17th January 1915 and was buried at Le Touret Military Cemetery, Richebourg-L’avoue. 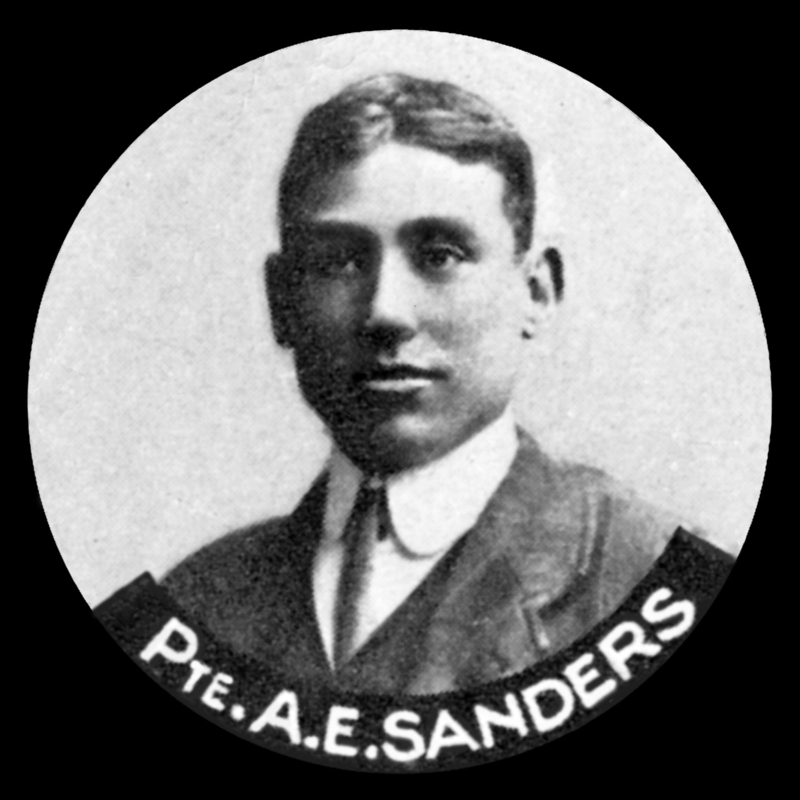 Alfred Edwin Sanders was born in Barrowden, Rutland in 1893. He was the eldest son of William Cooper Sanders and Sarah Agnes (nee Betts). Formerly an agricultural labourer, William Sanders was a labourer in a stone quarry in 1901 and in 1911 a labourer at a lime works. In 1911 Alfred was a 19 year old farm labourer and living with his parents. By 1914 he was working for the L. & N.W. Railway in Rugby and when the war started he joined the army as a private in the 3rd Battalion of the Coldstream Guards (regimental number 11020). He returned at Barrowden for a visit in October before arriving in France on 11th November 1914. On 23rd December he celebrated his 22nd birthday and on Christmas Day he wrote a letter home. A photo postcard of the King and Queen, received at Christmas, was forwarded home for preservation.